A History of George Mason University | 1964-1972: Permanence : The Green and Gold Mystery Solved! There have been quite a few differing explanations as to how George Mason University ended up with green and gold as its school colors. The most often-cited account is that they were chosen by a faculty member at George Mason College looking to design uniforms for the college’s first athletic teams, baseball, basketball, and rugby. Legend has it that H. Mebane Turner, the Dean of Students, chose green and gold because a relative of his played baseball for the University of San Francisco, and Turner thought their colors (green and gold) looked good on a uniform. There are others who are certain that the idea came from Christmas decorations in Chancellor Thompson’s office in 1966. Apparently, Thompson’s assistant chose green and gold as the color scheme. Thompson liked the combination so much, he made the decision to use them as the new Mason colors. Still others believe that George Mason’s home, Gunston Hall, which just happens to have a green bedroom and a gold dining room was the inspiration. Finally, and perhaps most oddly, it has been suggested that George Mason himself suffered from gangrene, a disease, which turns the toes green and yellow. So many theories exist, and each is very different from the others. One thing is for certain. 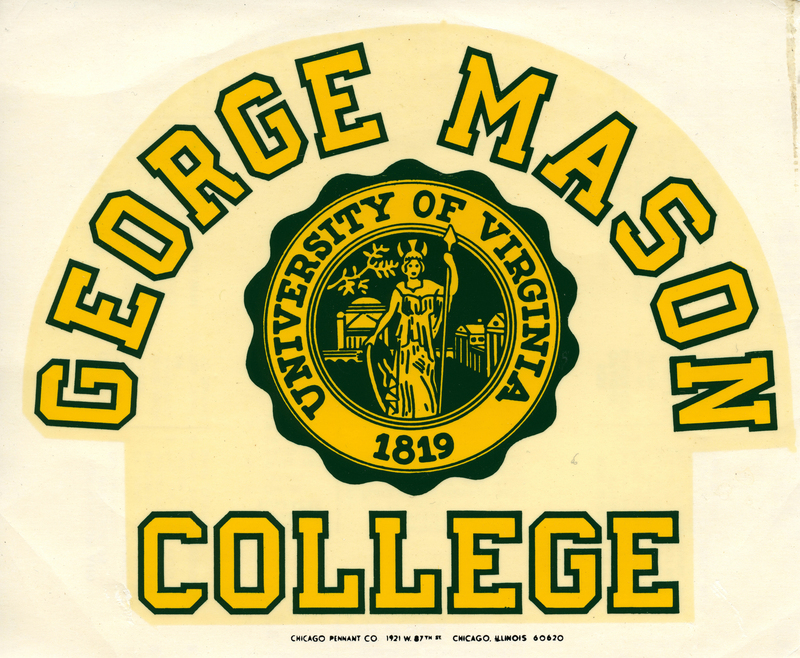 The green and gold began to be used extensively in publications by or about George Mason College beginning in 1966. While the 1965 Mason yearbook, Advocate, for example, was bound in blue and gold, the 1966 and 1967 printings featured a green and gold design. Other publications during the 1966 year also contained either predominately green or green and gold motifs. And yes, Mason’s baseball team showed off new uniforms in the new school colors in the 1966 edition of Advocate. Unfortunately, that publication was still printed in black and white, so the impact of the story was probably somewhat muted. A poll of the student body was taken to select the school colors… The colors selected by the students were green and gold. Only 103 (of 360 total students) voted in the poll, but green and gold received almost twice as many votes as the next most popular color. One of those who voted for the school colors was Ann Walker (Sparks). She recalled in 2004 that, since the majority of the students enrolled at George Mason in 1965 were from local high schools, their selections for the school colors were motivated by local high school rivalries. No one wanted George Mason to have the colors belonging to their former high school rivals. These two explanations have been suggested by various members of the George Mason University faculty and administration over the years. Since it is believed that George Mason had gangrene in his left big toe, it is a Mason tradition that students who rub the left toe of the George Mason statue located in the center of campus, it is said to bring good luck for examinations.